(NaturalNews) Scientists are one step closer to building autonomous waste-fueled robots, according to research published in the journal Bioinspiration & Biomimetics. Researchers from the Bristol Robotics Laboratory have designed a new pump that will allow a robot to power itself with human urine. In the past decade, the Bristol researchers have created four separate generations of EcoBot, designed to generate electricity from the digestive action of live microorganisms. All of them are fueled from some material that humans consider "waste," such as rotting fruit and vegetables, wastewater or sludge. The designers hope that these robots can eventually be used as autonomous sensors and monitors in areas that are too dangerous for human researchers, such as severely polluted locations. Like other biological "waste" products, urine will function as a suitable fuel source for the EcoBots. A video of microbial fuel cells using urine to charge a mobile phone can be seen at www.youtube.com. However, it will probably never be possible to generate large quantities of power from human urine. That's why the EcoBot is conceived for functions that involve monitoring and recording over a long period of time. Having a constant, easy-to-refill power source would enable it to continue recording and transmitting data around the clock. In the current EcoBot generation, urine must be delivered to the fuel cells via traditional motorized pumps, which are prone to blockage and mechanical failure. But now, researchers have designed a pump, modeled on the human heart, that could bypass these problems. The pump is designed from smart materials called "memory alloys." These materials compress when heated; in this case, the compression causes the pump to force liquid out and into the fuel cells. When the pump is empty, it sends a signal that cuts off the electrical current to it, causing the memory alloys to resume their original shape. This makes the pump relax and open up, and a new supply of urine rushes in. The pump then sends a new signal, which reactivates the current. Like a human heart, the pump can function indefinitely. "The artificial heartbeat is mechanically simpler than a conventional electric motor-driven pump by virtue of the fact that it employs artificial muscle fibers to create the pumping action, rather than an electric motor, which is by comparison a more complex mechanical assembly," lead author Peter Walters said. The main advantage of the new pump system is that it will allow the EcoBot to power itself from a reliable source of fuel. This is a major advantage over the last two models, which subsist off flies, which can be hard to find or capture . "We speculate that in the future, urine-powered EcoBots could perform environmental monitoring tasks such as measuring temperature, humidity and air quality," Walters said. 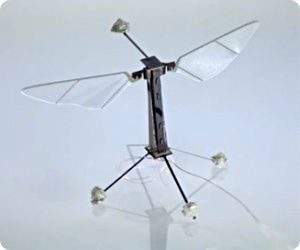 "A number of EcoBots could also function as a mobile, distributed sensor network," he said. "In the city environment, they could re-charge using urine from urinals in public lavatories. In rural environments, liquid waste effluent could be collected from farms." Researcher Ioannis Ieropoulos noted that, because the EcoBot is designed as a low-powered sensor that operates only in remote areas, it does not pose a threat of becoming a killer robot like those found in science fiction. In contrast, controversy erupted in 2009 over the Pentagon's plans for an Energetically Autonomous Tactical Robot (EATR) that could subsist on any "biomass in the environment." Critics questioned whether the giant foraging robot (equipped with powerful articulated arms) would commit war crimes by stealing food or fuel from civilians, or even devouring dead soldiers.